The 2016 Marco Symposium will bring together scholars who are reconsidering post-classical Rome (from c. 300-c. 1700) by emphasizing models that move beyond questions of renewal. The assumptions that traditionally were embedded in scholarly discussions of the collapse of the western empire as an independent unit in the wider Mediterranean and the concepts of rebirth applied to the period following the papacy’s return from Avignon have come under reconsideration. The return of antiquity, rooted in the revived memories of Rome’s imperial past, once held an important status in stressing the historical legacy of classical culture. Now, new approaches have permeated the fields of history, musicology, art history, and urban studies that focus on Rome. In their investigations of Rome after antiquity, scholars now see the city as a font of such developments as archiving church history, innovations in church governance, and the invention of new images. In light of the cultural vitality of Rome from the early Middle Ages to early modern times, current investigations suggest that memories of the ancient past actually generated new methodologies rather than stifling them. Bishops sought to establish their legacy by depositing textual accounts into the papal archives; indeed, this impulse to establish documentary repositories generated new forms of historical writing during the Middle Ages. Liturgical requirements shaped the musical interests of monks and clerics serving in the bishop’s church. Papal authorities developed new ritual formats for negotiating church interiors and city space. Inner-city burials, ascetic behaviors and the early medieval economies of salvation all speak to the innovations in social practices that stood apart from the cultural influence of antiquity. New construction in Rome benefited from the heritage of antiquity through the use of spolia; yet these pieces appropriated from ancient structures were the building blocks of innovative formats for recomposition. Literary genres reporting on the reactions of pilgrims and visitors in Rome launched new approaches to travel writing. 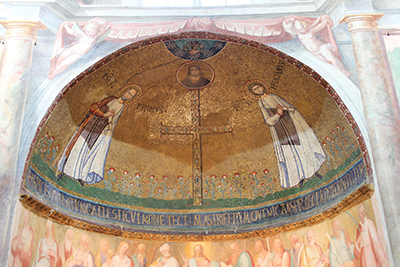 Image types and formats for programmatic painting originated in post-classical Rome; indeed, important centers for the production of art responded to the needs of the papacy. To be sure, the legacy of antiquity looms large in the historiography of Rome and should not be cast aside entirely. Yet it is now important to reflect upon the discourses on Rome that avoid the cultural assumptions of renewal so as to shed light on particularly local polemics and the specific dynamics of the city’s cultural life. All talks except for the keynote address will occur in the Great Room on the lower level of the International House on the University of Tennessee campus, 1623 Melrose Ave., Knoxville, TN.